How Do I Choose the Right Rug for My Dining Room? Here’s the big question: how do I buy the perfect rug? The unsung heroes of the interior design world, a well-placed rug can take your space to the next level. But how do you find that perfect rug? Here are three steps to take you to rug nirvana. Rug material options can be broken down into basically two categories: natural fibers and synthetic rugs. At the Perfect Rug, we offer a broad selection of area rugs made from wool, synthetic, sisal, and grass. But what do these mean, exactly? Which one should you choose? Wool is a popular rug material option and for good reason. Wool rugs combine comfort and durability and are a lasting investment for you and your family. We recommend wool for the spaces in your home where you value comfort, like a bedroom or family room. Wool rugs are naturally stain and spill-resistant and will treat you well if you take care of them. With this material, you’ll want to consider rug placement as wool will absorb humidity and can fade in the sun. Made of natural fibers, sisal rugs are extremely durable. Sisal is an ideal choice for customers seeking a more natural look. While there’s little to compare to wool for softness, sisal rugs work well in public areas of your home like the living room or dining room where you won’t be looking for that between-your-toes squish. Like sisal, grass offers a more natural look and is environmentally friendly with no chemicals or additives. From mountain grass to sea grass to jute, grass rugs bring a sustainable feel to your space and are easily customizable. Synthetic rugs offer a wider variety of colors and patterns to choose from than the organic options. They stand up to heavy traffic and are often pre-treated to avoid stains (bonus!) and are on the more affordable side (double bonus!). You might want to request a sample before buying a synthetic rug (particularly if purchasing online) as some synthetic varieties are better than others at creating an organic feel. Another reason to test a sample first is if chemicals are an issue in your home. If so, an organic or natural fiber rug might be the safest choice for you. Whew, that was a lot of information. So now that you’ve weighed the pros and cons of each material, let’s decide on the size. Getting the size right is essential in designing your rug. First, determine how much floor space you actually have with a tape measure. Make sure to take note of how much traffic the area gets, furniture and any other factors that could determine your rug size and shape. 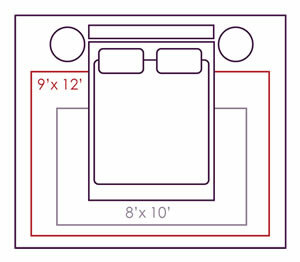 Also check standard sizes for your space; often these are a good starting point to build from. For more detailed information, see our Rug Sizing Guide. Step Three: Custom or ready-made? The answer to this all depends on your space. Will a standard rug size, like 9x12 or 6x9 work perfectly for your space? If so, one of our Ready-Made Rugs might be a more economical option. However, ready-made rugs are not customizable; if you’re looking to pull in colors from around your room to create cohesion or need a nonstandard size, a custom rug is the right choice. Rugs have the potential to pull a room together and take it to the next level. 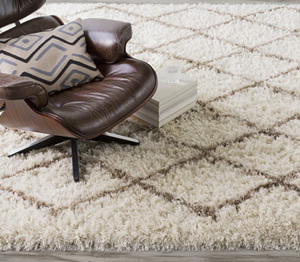 Make sure you choose the perfect rug for your perfect space. Have questions? Feel free to email us at customerservice@theperfectrug.com or request a free design consultation.